Background: Psoriatic arthritis is a chronic inflammatory arthropathy that affects 14%- 30% of patients with skin and/or nail psoriasis, leading to severe physical limitations and disability. It has been included in the group of spondyloarthropathy with which it shares clinical, radiologic, and serologic features in addition to familial and genetic relationship. Beyond skin and joint involvement, psoriatic arthritis is characterized by a high prevalence of extra-articular manifestation and comorbidities, such as autoimmune, infectious and neoplastic diseases. In particular, an increased risk of cardiovascular comorbidity has been observed in psoriatic arthritis patients. Methods: A systematic search was performed in the electronic databases (PubMed, Web of Science, Scopus, EMBASE) up until January 2017. Studies were included if they contained data on CV disease and/or risk factors in PsA and each article was then reviewed for quality and clinical relevance. After completing the literature search all screened literature was summarized and discussed in our study group (CaRDDs study group). All literature and comments were included in the systematic review. Results: The initial search produced 278 abstracts, which were narrowed to 83 potentially relevant articles by preliminary review of the titles and by excluding review articles and case report (n = 195). Thirty articles were deemed ineligible after examining the abstracts. Full texts of the remaining 53 articles were retrieved. The majority of articles excluded were due to only providing data on patients with psoriasis or due to being not relevant to the CV risk in PsA. In the end, 32 articles were deemed eligible for this review. Conclusion: Psoriatic arthritis appeared significantly associated with subclinical atherosclerosis and endothelial dysfunction and, in turn, with an increased cardiovascular risk. Thus, patients with psoriatic arthritis may benefit from a periodic assessment of surrogate markers of cardiovascular risk. This could help to establish more specific cardiovascular prevention strategies for these patients. 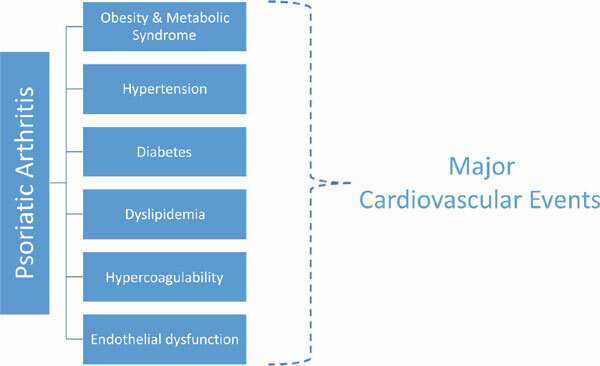 Keywords: Cardiovascular risk factors, endothelium dependent dilation, flow-mediated dilation, intima-media thickness, psoriatic arthritis, atherosclerosis. Keywords:Cardiovascular risk factors, endothelium dependent dilation, flow-mediated dilation, intima-media thickness, psoriatic arthritis, atherosclerosis. Abstract:Background: Psoriatic arthritis is a chronic inflammatory arthropathy that affects 14%- 30% of patients with skin and/or nail psoriasis, leading to severe physical limitations and disability. It has been included in the group of spondyloarthropathy with which it shares clinical, radiologic, and serologic features in addition to familial and genetic relationship. Beyond skin and joint involvement, psoriatic arthritis is characterized by a high prevalence of extra-articular manifestation and comorbidities, such as autoimmune, infectious and neoplastic diseases. In particular, an increased risk of cardiovascular comorbidity has been observed in psoriatic arthritis patients.